COMET 217248A, EXACT OEM REPLACEMENT FOR ASW/MANCO 5959 Go Kart Belt for Comet 30 Series. 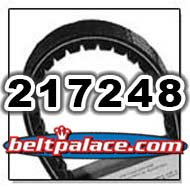 Heavy Duty Kevlar superior to import grade ASW/Manco 5959 Aftermarket belts. Replaces 669 ASYM belt from imported TAV kits from China (silver plated).